A former French and Spanish colony, Iowa is the only US state bordered by rivers and one of the safest American states in which to live. Iowa enjoys a very diversified and advanced economy, including information technology, biotechnology, and green energy production. Agriculture is the backbone of the state’s economy, making it the nation’s largest food product producer. Foreign entrepreneurs starting businesses in Iowa should feel confident knowing that their personal assets are protected. Limited liability companies and corporations separate the assets and liabilities of companies from the personal assets of the business owner. Iowa requires that a C corporation or an LLC not have a name that is the same or could be confused with a business already in existence. To make sure your business name is eligible Inc. Plan can help you with a free corporate name search. Creating a unique corporate name enhances your company’s reputation and also helps protect the identity of your brand. The state of Iowa recognizes businesses that choose to operate either as a C-Corp or an LLC. The type of business entity you choose determines the nature of the taxes to which your entity will be subject. Under Iowa law corporate taxes are either based on a corporation’s net income or the income tax return of the members of the LLC. Iowa does not have any residency requirements. Owners and directors of companies do not need to live in state to legally operate an Iowa company. Before your firm is legally eligible to operate, make sure you possess all the required business licenses, permits, and tax registrations. If you need assistance, Inc. Plan can help you make sure your business is in compliance. It is mandatory for Iowa C-corps and LLCs to have at least one owner/member. State law only requires C-corps directors to be listed in the incorporation documents; LLC members do not need to be included. There are no age restrictions imposed for LLC owners, but C-corps directors must be at least 18 years old. When forming a Limited Liability Corporation certain steps must be taken to keep the business in compliance on an ongoing basis. 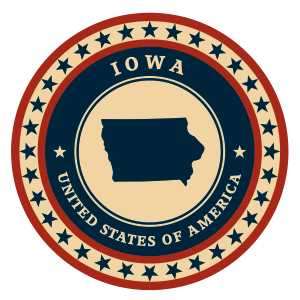 In order to qualify under the Iowa law, LLC names must end with the term “Limited Liability Company”, “Limited Company” along with their abbreviations “LLC”, “L.L.C.”, “Ltd. Co.”, “L.C.” or “L.C.”. People looking to form an LLC must submit a Certificate of Organization to the state. Iowa requires LLCs to file a biennial report which is due between January 1st and April 1st. It is possible to submit the annual report online. The Certificate of Organization must contain the name and address of a registered agent who resides in Iowa and who is available to manage legal and tax business documentation. For more help filing an incorporation or with finding qualified registered agent services feel free to contact Inc. Plan (USA). Iowa LLCs are taxed based on its members’ personal income. However, LLCs can opt to be charged as C corporations or partnerships for federal tax purposes. Iowa-based companies are allowed to use name endings like “Company”, “Corporation”, “Incorporated” or “Limited”, along with their abbreviations. Names must be unique and not deceptively similar to existing companies. Companies incorporated in Iowa are required to file a document called Articles of Incorporation with the state. State law also requires corporations to file a biennial report which is due between January 1st and April 1st. The biennial report can also be submitted online. The Articles of Incorporation must list of the company’s authorized shares along with their assigned par value. The Articles of Incorporation must include the name and address of a registered agent with a physical Iowa address. Inc. Plan (USA) can help you with the necessary filings and also provide qualified registered agent service. Both domestic and foreign corporations are subject to a corporate income tax at a minimum rate of 6% of the taxable net income. However, if you are a financial institution then you also qualify for a franchise tax at a 5% rate of the net income obtained during the taxable year.